Ask fellow campers about "Branson Lakeside RV Park" and nearby attractions. Answer: We do not have a Good Sam's membership so we pay more. I think we paid about $45 for full hookups. Keep in mind that the parking spots are very small. The big advantage is that it is VERY close to all the action in Branson. It is always busy. We drove by there just this weekend and the park was packed! The park is owned by the city of Branson - a good investment for them. Question: Is there transportation to Dolly Parton stampede? Answer: There is a free trolley that runs a loop through the park and city. I cannot say for sure it goes out as far as Dolly Partons. Beautiful park with nice lakeside views. Plenty to do. Some sites are close to neighbors but all around us are very friendly. We camped at Branson Lakeside RV Park in a Motorhome. This was a basic facility with restrooms and showers but nothing else. full hookups including wifi and cable. excellent location to lake taneycomo and the branson landing area. some sites are double wide with firerings. We camped at Branson Lakeside RV Park in a Fifth Wheel. Park is easy to access from Hwy 65 but use the directions offered on their website. Relying on your GPS may find you on some narrow streets in old town Branson. Their guest service is excellent and we like that they guide you to the site. For a more established park, sites are adequately spaced for big rigs. We had no problem extending four slides and our awnings. Traffic noise was not an issue but during our stay there were some loud barking dogs whose owners might have been more considerate of other guests. We enjoyed the view of the bridges and river. They have seating decks to relax on near the water. There is a nice little club room with helpful information about Branson attractions. Staff is also very willing to offer suggestions. Trash is picked up daily at your site. We stayed during the week after Labor Day and had a very good experience, a little calmer and more laid back than during their busiest time. We've visited Branson a few times but this was the first with our RV. We would definitely stay at this park again. We camped at Branson Lakeside RV Park in a Motorhome. Campground is tight and most pull throughs are "buddy sites" but you really aren't there for the campground anyway. Bring a grill or elevated firepit since ground fires are not permitted. We camped at Branson Lakeside RV Park in a Travel Trailer. All of the sites are VERY small. Depending on your camper and the camper next to you, you may or may not be able to put out your awning. We were on site 173 which is right next to the pavilion. The pavilion is open to the public, in addition to that that is the road to the community boat ramp. All of the neighbors connections (Sewer, Water, Power) were right by our picnic table. The shuttle bus quits at about 530ish, so if you go to dinner or such you may not have a ride back. The bathhouse is old and outdated, no so much as dirty as just old. The campground is run by the city so the employees are not real concerned about the guests. We camped at Branson Lakeside RV Park in a Fifth Wheel. My husband and I are TERRIBLE backers. We can't back a trailer AT ALL. We are the entertainment at every campground we go to. It's embarrassing. The more we practice the worse we get. I said all that to say this - Branson Lakeside has PULL THROUGH sites. And a lot of them! You can reserve one. They are also very close to all the things we want to do. The sites are tight though. Go when school is in session to avoid a lot of noise. You'll enjoy it more. We used the showers - nice and clean. We used the cable and wifi - worked great. We walked to the Landing - easy for even us, and we are old. I've stayed at most Branson campgrounds. This is my favorite. Sites are tiny though. We camped at Branson Lakeside RV Park in a Travel Trailer. There are a lot of things to do within walking distance. If you have a power scooter or bike, you will use it. Close to a marina where you can rent all kinds of watercraft - paddle boats, kayaks, pontoon boats, and you can take a ride on a Riverboat there too. Really crowded on holidays. Branson is a popular tourist attraction. Just spent a week here. Best wi-fi we have ever had. Staff very friendly and helpful. Would stay here again. 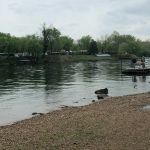 We camped at Branson Lakeside RV Park in a Travel Trailer. Close to Branson Landing and downtown. Some traffic noise from bridges and I have never heard so many sirens. Park is owned by city of Branson. Good fishing on the lake at times. Saw some nice trout. 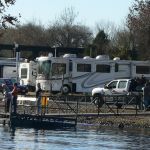 A first-class RV park operation with a staff who knows what they are doing. 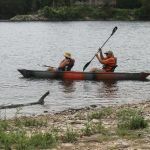 We have stayed at other parks in the Branson area, further info town or up in the hills, but find this one can't be beat. Worth it to get a premium site to look out at Lake Taneycomo. Easy to get into town. Sites are very level. There is road noise from traffic going over the bridges, and boats going up and down the lake, and the tourist trains which go nearby, but we found it fine. Bike trails go right to the Branson Landing shopping center and Bass Pro Shops, so for biking, its great. Very nice and secure place to stay. There are no open fires allowed. We camped at Branson Lakeside RV Park in a Motorhome. With about 150 shows a day, amusement parks nearby, there is no shortage of things to do in Branson. The main post office is several minutes away, convenient for having your mail forwarded as well. Staff friendly!! Location is great!!! Can walk to Branson Landing shops and restaurants. Cable was very good. Full hookups easy to access. The negatives were how close you are to your neighbors. With both of us having slides out it was crowded. Picnic tables were pretty worn. The biggest negative were loud neighbors who were partying until 1:00 in the morning. Other campers yelling at them to quiet down. They refused. 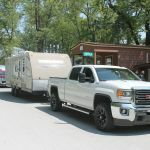 Too much of a negative and we didn't want a confrontation and left early and checked into another campground We camped at Branson Lakeside RV Park in a Motorhome. This was our 4th stay at this park this year. Every stay was excellent. Friendly staff, fast service, clean and well groomed park. Nice walking areas, very pet friendly. Noise levels were very low. We camped at Branson Lakeside RV Park in a Motorhome. Great restaurants close by (2 with in easy walking distance). Highly suggest calling ahead for directions, as most GPS units will not get you there easily in an RV. We found these directions to work really well: Jct of Hwy 65 & Hwy 248 (Branson Landing Exit): Exit Branson Landing Blvd to circle, take 3rd exit, then stay in L lane (R lane ends) thru 3 traffic lights, then straight into park Note: Do not cross bridge & do not use GPS. The location is the best part of this campground. Easy to by-pass the traffic jams common to the Branson area. Excellent advice and tips provided by hosts in the office. Great access to Branson Landing and to sites such as School of the Ozarks, Top of the Rock, and the southern side of Table Rock Lake without ever having to deal with the heavy traffic in Branson proper or the "strip". We camped at Branson Lakeside RV Park in a Motorhome. They now charge for premium wifi and the free wifi is unusable. I did a speed test and the free wifi was .7 Mbps. Manager was very unfriendly when I checked in. You share your front yard with the RV next to you. Sites have 2 picnic tables but ours only had 1 picnic table. They said they would bring us another but never did. We have stayed here many times and this was the first time I had any complaints. Love the location, close to the Landing and on Lake Taneycomo. They do not allow late checkout so we paid for an additional night to stay an extra hour. We camped at Branson Lakeside RV Park in a Fifth Wheel. The shuttle is nice to go to a Bass Pro or downtown. But we got on it from stop 3 to come back to the RV park and it took an hour. We could have walked it in 10 minutes. Didn't know if we would be able to get into the park because they had experienced 4' flooding just a week before. They were still doing a lot of repairs when we arrived, but we were on the second row from the river and the water had receded a good bit. First night we got to experience how well built their bathhouse was as we gathered with others to wait out a storm! 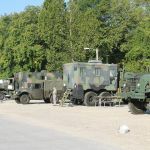 The next day we had to move to higher ground because they released water from the dam, but they were able to accommodate our group of 5 RVs. Convenient to everything, and a trolley came by every 20 mins until 6 pm. It was perfect for what we needed and our whole group had a great time. We camped at Branson Lakeside RV Park in a Fifth Wheel. My second time here and I'll return. Great bang for the buck. We had premium site facing the lake. Just beautiful. They come collect the trash. I got a good satellite signal. Staff was friendly and most helpful. Wonderful location....you're not that far from the main strip and they have the bus that comes thru to take you downtown. We camped at Branson Lakeside RV Park in a Motorhome. obviously many places to see/do in Branson. I've been here in summer and winter. check out Hook n' Ladder pizza in Hollister, just a couple miles away. Hook-ups are bizarre. Septic, water and elect may be, but mostly are not, on the correct side. Site had 1-2 ft drop off 4 ft from door. Not safe. 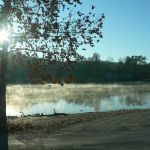 We camped at Branson Lakeside RV Park in a Travel Trailer. Lamberts "Throwed Rolls" café in Ozark well worth the drive. If you have your mail forwarded, the main Post Office on commercial street is minutes away. Experiment with the various routes that the city of Branson has, Red, Yellow, Blue, to save time and avoid some of the long backups going into the theater area. There are a total of 159 attractions in Branson, and almost 120 live shows. We always catch Presley's Country Jubilee, the Duttons, Rick Thomas the magician. Take the free trolly and be sure to check with the office for discounted tickets or just great ideas on where to eat or what to do. They recommended two restaurants that we loved - both family owned and in old downtown. Honestly if it wasn't for the wonderful staff we probably would not recommend this place. 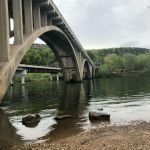 Great access to Branson Landing and to sites such as School of the Ozarks, Top of the Rock, and the southern side of Table Rock Lake without ever having to deal with the heavy traffic in Branson proper or the "strip". The location is the best part of this campground. Easy to by-pass the traffic jams common to the Branson area. Excellent advice and tips provided by hosts in the office. Just a few blocks from old downtown Branson. Walking distance to the Branson Landing. Fishing docks at the camp ground. Grab a fishing pole - walk 20' and bring home dinner. Lots of shopping within walking distance. The fish restaurant on the lake owned by Bass Pro Shops is awesome and a great bargain. Cornbread and desserts great. Chowder Superb. Ditto the Trout almondine for $12 bucks. Easy walk. White Fish Grill across from Bass Pro Shops is a short walk and a great place to eat. It's on the water and the key lime pie was the best I've ever had. Highly suggest calling ahead for directions, as most GPS units will not get you there easily in an RV. We recommend doing the 'Ride with Ducks' tour and the Parrot Pete Zip line. They are right next door at Branson Landing. 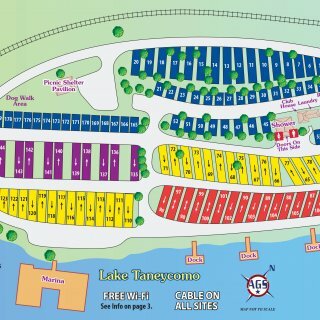 Are you affiliated with Branson Lakeside RV Park ?